If you’ve ever driven alongside a commercial truck or any other large vehicle, you know how frightening the prospect of collision can be. Unfortunately, commercial vehicle accidents do happen with some regularity, and they are known for producing catastrophic injury and even death. Drivers of these vehicles are required to follow the same rules of the road as the rest of us — but they’re also subject to additional requirements under state and federal law. Unfortunately, the drivers and/or their employers often neglect these rules, putting others at risk along the way. At Van Sant Law, we care about the struggle that victims of these accidents and their families will face. The damages can be overwhelming and the expenses seemingly insurmountable. That’s why we dedicate our Georgia personal injury law firm to representing those who’ve been injured unexpectedly through no fault of their own. If you or a loved one has been injured or killed in a commercial vehicle accident in Georgia, an Atlanta auto accident attorney at Van Sant Law can help. At-fault parties and their insurance agencies usually try to pay you less than you’re owed under the law. Don’t let them bully you or give you the short end of the stick. We’ll fight for justice on your behalf. Commercial truck accidents happen for all the same reasons as any other auto accident: driver negligence, speeding, vehicle rollover accidents, and more. But they also happen because the drivers violate laws that apply specifically to commercial trucks. For example, the law provides strict rules about the number of hours a driver can stay behind the wheel, how often they must take breaks, and how long those breaks must last. Why? Because truck drivers spend many hours alone on the road, and those hours can grow tiring. Driver fatigue is a deadly problem in the commercial trucking industry. Sleepy drivers and huge trucks make for a perilous combination. 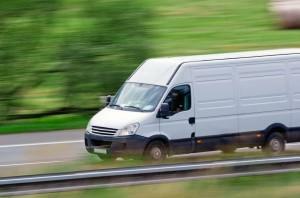 Unfortunately, employers often pressure drivers to adhere to a rigid delivery schedule. That pressure encourages corner cutting when it comes to the rules. In other cases, employers may entrust large commercial vehicles to inexperienced or improperly trained drivers. Because commercial vehicle accidents involve more significant damage and more complicated laws, it’s especially important that you work with a Georgia personal injury law firm that has ample experience in this area. At Van Sant Law, we understand that commercial vehicle collisions aren’t simply standard auto accident cases with a bigger car. They require a different approach, more sophisticated strategy, and a deep understanding of the relevant procedure and laws. You should remember that time limits apply to these cases, and the insurance companies will probably pressure you to settle quickly. Don’t listen to them. No matter what they imply, insurers do not represent your best interests, and they usually offer less than you deserve. Before making any decisions or talking with the other side, get in touch with an experienced Atlanta auto accident attorney. To schedule a free consultation, simply call our office or contact us online through our contact form. We proudly represent clients across Fulton County, Alpharetta, Atlanta, and all of Georgia. Time matters, so don’t delay.